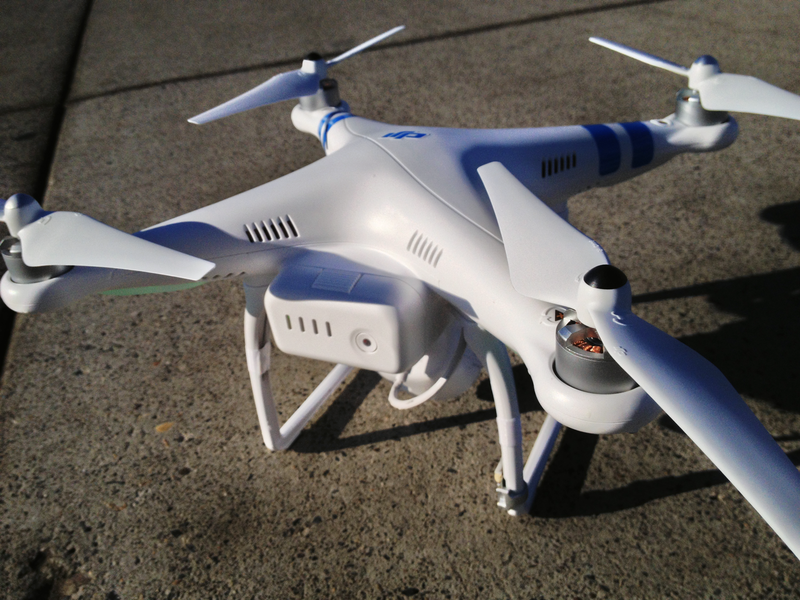 The advent of affordable quadcopters has made aerial photography accessible for almost anybody. Getting really good results still often takes a bit more than just attaching a GoPro to a quadcopter. A few months ago, I looked at the DJI Phantom and that was already a lot of fun to fly, though the images you could get from an unmodified Phantom can be quite shaky. Now, DJI has launched the DJI Phantom 2 Vision, which comes with a built-in camera you remotely control through your phone. As far as out-of-the-box quadcopters go, the $1,200 Vision sets a new standard for anybody who wants to get into aerial photography and is a heck of a lot of fun to fly. One thing to remember here is that you are looking at a prosumer device – and not just because of the price. This is not the kind of remote-controlled helicopter you can pick up at any discount store today. Just like its predecessor, the Vision has a built-in GPS unit that allows it to fly back home if the connection to the remote controller is ever interrupted. In the near future, DJI will release an app that will turn the Vision into an autonomous drone by allowing you to input GPS coordinates and have it fly a circuit without your input. What makes the new Phantom stand out, though, is the fact that you get a direct video downlink from the camera that shows up on your iPhone or Android device. To do this, DJI built a mobile app and added a Wi-Fi extender to the remote (which you have to charge separately). As the remote has a range of up to 1,500 feet, the Wi-Fi connection between the phone and Vision would likely break up after just a few hundred feet. With the USB-charged Wi-Fi extender, you should be able to keep the video going up to almost 1,000 feet (though all of this always depends on your local conditions, too). The phone app comes in handy for more than just seeing the video link. It also includes a heads-up display with all the pertinent information about your flight, including speed, distance, height and battery life. You can also use it to see a radar-like screen that tells you where exactly your quadcopter is in relation to your own position. The phone controls all the settings for the built-in camera. The wide-angle camera itself is comparable to a GoPro Here 3 Silver Edition and can, among numerous other settings, take 1080p video at 30 frames per second (fps) and 720p video at 60 fps. Unlike the GoPro, it can also record 1080i at 60 fps. Thanks to the built-in vibration-damping platform underneath the vision, the video you get from this unit is significantly better than from an unmodified Phantom 1. When it comes to these kinds of videos, higher frame rates are often desirable, as the slowed-down video makes the recording feel quite a bit smoother. All of the images are beamed to your phone, but also stored on a microSD card. Using your phone, you can start and stop video recordings, but you can also take still images. The 14 megapixel camera doesn’t exactly rival a DSLR, but does a nice job of keeping up with different lighting conditions and in a pinch, you can always set your exposure settings manually from the app. You can also take images in RAW format, but so far, DJI hasn’t made any tools available to actually read these images in Photoshop or other photo-editing suites (chances are it will at CES this week). I’ve got a feeling these kinds of images will be the next trend in wedding photography (let’s just hope the photographers are better fliers than this guy). The gimbal underneath the Vision only moves vertically, so it doesn’t fully eliminate vibrations and only compensates for the quadcopter’s forward and backward motions. When you’re flying sideways, your image will also be slightly tilted to the side. Overall, though, this system does away with virtually all of the dreaded “jello effect” that often marred videos from the original Phantom when paired with a GoPro. Unlike the previous Phantom, which had a battery life of about 10 minutes, the Vision comes with a far more powerful battery. I didn’t quite feel like crashing my review unit by running out of juice (though it should automatically land itself if it does indeed run out), but in my tests, the unit easily stayed in the air for a good 25 minutes, which is on par with DJI’s promises. In return, though, the battery, which includes the on/off switch for the quadcopter, is proprietary and an additional unit will set you back about $150. How hard is it to fly the Vision? I’m not an experienced RC flyer, but just like the earlier Phantom, the Vision is pretty easy to get in the air and land after you’ve watched the introductory videos. Once it’s flying, the live video and radar scope make it straightforward to stay in control, though inexperienced flyers should definitely go slow at first. This isn’t a toy, after all, and it has four fast-spinning rotors that could easily hurt somebody. Because of this, you probably want to stay away from people at first (and trees, power lines and everything else, really). I never quite crashed the Vision, but I did make a couple of ungraceful landings that didn’t seem to faze the Vision. If it’s anything like the original Phantom, which I did manage to crash into concrete and trees when I tested it, it should stand up to quite a bit of punishment. It’s also worth remembering that the FAA would prefer it if you didn’t fly any remote-controlled planes within the proximity of an airport (three miles is the standard for regular remote-controlled aircraft) and to keep them under 400 feet. If you have $1,200 dollars burning a hole in your pocket, the Vision is probably among the coolest toys you can buy right now (and hey, it’s even $200 cheaper than Google Glass). It won’t let you start your own Amazon Prime drone delivery service, but it’ll give your videos and photographs a whole new perspective.